On Wednesday April 10, 2019 at approximately 9:54 a.m., police responded to a school on Ontario Street for a report of a student assaulting staff members. Investigation revealed that a 14 year old student had assaulted three staff members after becoming upset with them. The staff did not sustain any major injuries as a result. The suspect was subsequently placed under arrest and stands charged with three counts of assault and was later released by way of a promise to appear in court and officer in charge undertaking. On Wednesday April 10, 2019 at approximately 6:29 p.m., police were called to attend a residence on Condie Street for a report of a female breaching her release condition. Investigation revealed that 32 year old female suspect had attended the residence and that she was on an officer in charge undertaking with a condition of not to attend the residence. The suspect was subsequently placed under arrest for breaching her officer in charge undertaking and later released by way of an Appearance Notice to answer to this charge. On Sunday April 14, 2019 at approximately 7:42 p.m., police were called to attend a residence on Elmsley Street north for a report of a possible domestic assault. Investigation revealed that a 26 year old male suspect had assaulted his girlfriend. The suspect was subsequently placed under arrest for one count of domestic assault and one count of breaching his probation order release condition. The suspect was held for a bail hearing to answer to these charges. 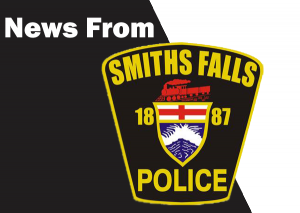 The Smiths Falls Police Service urges anyone with further information regarding these, or similar incidents, to contact our service at 613-283-0357. Information may be provided anonymously by calling Crime Stoppers at 1-800-222-TIPS (8477).